In the past three months, I’ve spoken to six hundred and forty one founders (yes, I counted :)) of various types of companies located everywhere from the Bay Area to Boston and across the pond from Estonia to London. While the stories were rich with an enormous amount of learnings, one thing I asked every single person I came into contact with was: how many prospects or customers are you speaking with each month in a non-sales/customer development capacity? Hearing from these entrepreneurs broke my heart, because ever since Steve Blank pioneered the formal methodology of customer development, the concept is one of the most common themes you can read in the interviews, posts, and books from successful entrepreneurs. Yet, my experience was proving that the rest of us weren’t doing our homework to reach that level of success. 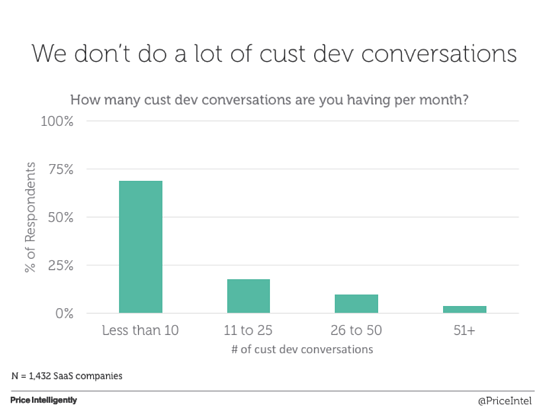 To temper my qualitative experience, we decided to collect some cold, hard data by asking 1,413 SaaS founders, heads of product, and marketing leaders about their customer development practices. The rest of this post is the data, as well as some commentary. If you want to save some time, just know it’s not pretty. 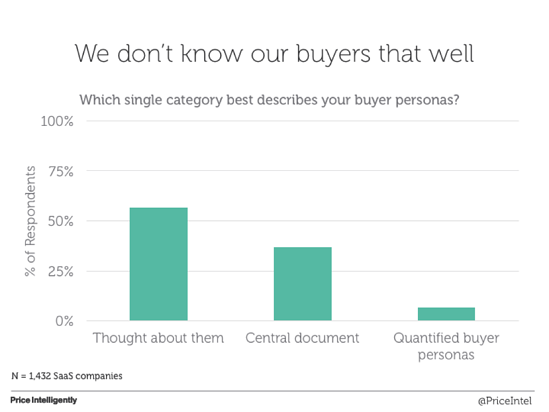 Quantified buyer personas are the bedrock of some of the best and brightest SaaS companies out there. The difference between “buyer personas” and “quantified buyer personas” is that in the former, you basically get in a room and debate/discuss what you think are your buyer personas and the come up with cut names like Startup Steve and Entrprise Eddie with some fun avatars. In the latter, you’re actually collecting quantified value data, such as usage statistics, price elasticity data, the unit economics of each buyer, and the like. Most folks who have quantified buyer personas are absolutely “crushing it” (for the lack of a better phrase). Yet, most of us aren’t doing much in terms of the persona department as you can see in the below. Most of you have some concept of your buyers, at least at a high level. You wouldn’t be building the product you’re building without them. Yet, the reason most of us don’t have these quantified buyer personas is because we’re not talking to nearly enough of our customers. How can you expect to know what to put on your pricing page, why customers are churning from your product, or what to put in your ad copy if you have no idea who you’re building the product for? Further, how can you expect a team of more than a couple of people to scale a product for a customer persona set without having some sort of central document for those customer personas? You can’t, but more debunked excuses below. “Well, we’ll run surveys for that data”. No we aren’t. Some qualitative responses to the survey then came up with “well, we’ll run surveys to get that data; we don’t need to waste time talking to customers.” Unfortunately, we’re not running customer development surveys. 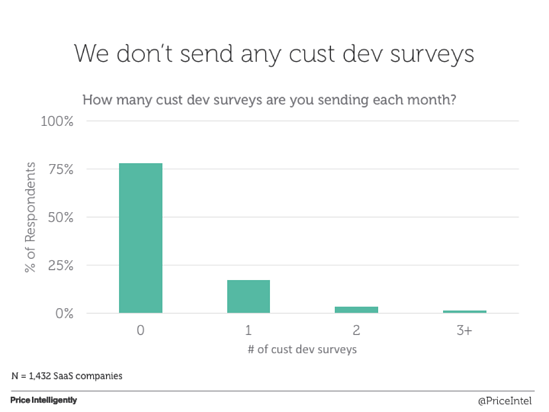 As you’ll see in the below, most of us are running 0 customer development surveys each month, even though companies like Intercom, Drift, Qualtrics, Survey Monkey, and Price Intelligently (shameless plug) have made this exceptionally easy to do. Plus, for the companies that are running surveys, most of them are way too long and breaking some of the cardinal sins of data collection. “We don’t need to talk to people. We test.” Again, nope. We’re not. Next up in the excuse department came, “well, we don’t need to talk to customers or run customer development surveys, because we run multi-variate and A/B tests. 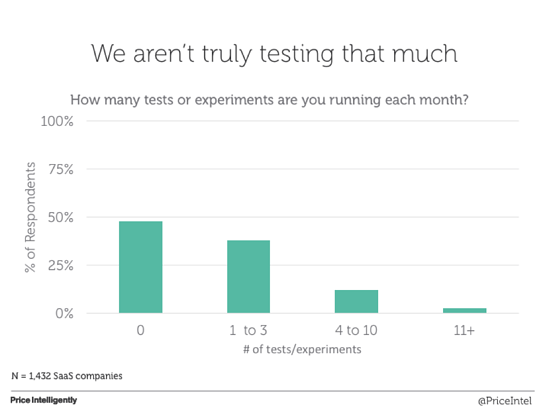 Aside from the fact that most companies can’t get proper volume to accurately run most tests, the data indicates we’re not running nearly enough tests to justify not talking to customers. Ideally we’d talk to customers and then also run tests based on that research, but sadly we aren’t. What are the rest of us doing? CACing your way to success. This means that unfortunately a lot of us are running some extremely inefficient businesses that lack a lot of customer development discipline to properly take advantage of the beauty of the subscription model. Put another way, we’re using Customer Acquisition Cost to grow our companies, when in reality there’s much more powerful ways to grow a business through retention and monetization. This really started helping, because we magically started to work towards that key result which floated up to an objective of knowing our customers much better than we did previously. We started with having 15 customer development conversations each month and running two surveys per month. A lot of us stay extremely reactionary to support. We just want to help our customers and users get their answer so they can get on their merry way to loving your product. We haven’t changed that, but to help in our customer development efforts we took a step back and ensured that any feature requests, complaints, etc. were met with a question that worked to get to the root of the UX or product issue. Frankly this is the hardest one because it’s not task driven. Like most teams, we have a lot of strong personalities and opinions. To stop “politicking” to a solution (or as we like to call the “argue, guess and check” method), we now use “let’s get some data” as the default. Sure, the data might not answer our total question, but it’s too cheap in time and money to get answers these days not to at least wait a day to collect some data that supports or refutes your opinion. The cost of just building or wasting a ton of time arguing far exceeds the quick survey or few customer conversations to get to the root of an answer. At the end of the day, I’m a bit pessimistic. After talking to thousands of SaaS companies about these concepts for four years, I just know that a lot of companies aren’t going to change their ways. For some of those companies, they’ll get lucky or be able to throw enough money at the problem that they’ll be fine, and that’s ok. There are different ways to grow. For the rest of us, efficiency and knowing your customers more than anyone else is going to continue to be a bedrock skill you’ll need to have, especially since we’re heading into an odd economic climate.